Veteran journeyman screenwriter Dan Gilroy made his directing debut three years ago with the critically acclaimed NIGHTCRAWLER, and coaxed a career-best performance out of Jake Gyllenhaal in the process. It was a challenge to base a film around one of the most repulsive protagonists in recent memory--Louis Bloom, a petty thief specializing in copper wire and chain-link fencing who makes a name for himself selling accident and murder footage to a desperate, bottom-ranked L.A. news station--and Gilroy explores similar themes with the legal drama ROMAN J. ISRAEL, ESQ. 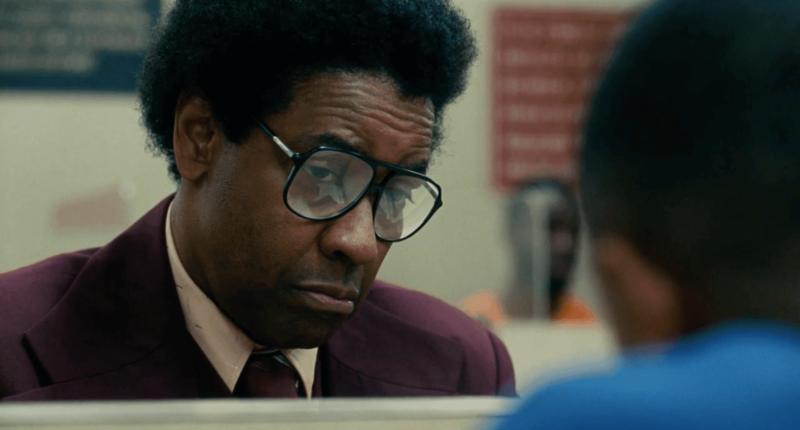 Played by the great Denzel Washington, the titular character is ultimately just as morally and ethically challenged as Louis Bloom, but he's not a bad guy. He's just as much of a misfit, though where Bloom was an unrepentant sociopath, Los Angeles defense attorney Roman J. Israel is a savant who eats nothing but peanut butter sandwiches and has the entire California legal code memorized. He works behind the scenes as part of a two-man firm, and his elderly partner--the face of the practice and the guy who appears in court--has just gone into a coma after a massive heart attack, leaving the abrasive and socially awkward Roman--in no way a people person--to handle his cases in front of a series of increasingly exasperated judges. Roman is a career civil rights activist with a borderline Cornel West afro, unfashionable eyewear, and mismatched, ill-fitting, ragged suits that look like they've been worn for 30 years (Washington's also wearing some padding to add a little girth to his midsection). 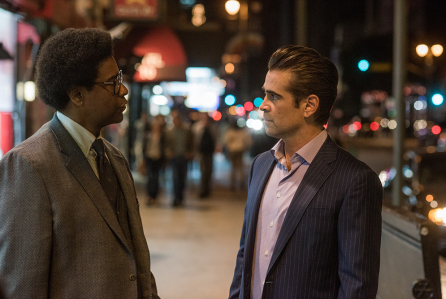 He has a brilliant legal mind, which is why his partnership with his aged colleague has worked, but with the old man out of the picture, the practice has been handed over, per his wishes, to slick, high-priced criminal lawyer George Pierce (Colin Farrell), a former student and protege of whom Roman was completely unaware. The practice has been losing money due to its taking on a large of pro bono, social activism cases that Roman lives for, so with the blessing of the ailing lawyer's family, Pierce shuts it down and reluctantly agrees to take Roman on as an attorney at his own hugely successful firm. With Roman's appearance and his dinosaur ways--he has a battered, ancient flip phone and hates computers, relying on index cards, countless Post-Its, and voluminous stacks of documents precariously clipped and rubber-banded together--Gilroy could've just as easily taken this situation and made it a mismatched, fish-out-of-water buddy comedy. Instead, it's a character piece and a morality play where Roman, who can't help but burn bridges at Pierce's office because that's what he does, snaps after nearly losing his job over his botched handling of client Derrell Ellerbee (DeRon Horton), a 17-year-old being charged as an accessory in the murder of an Armenian convenience store clerk. 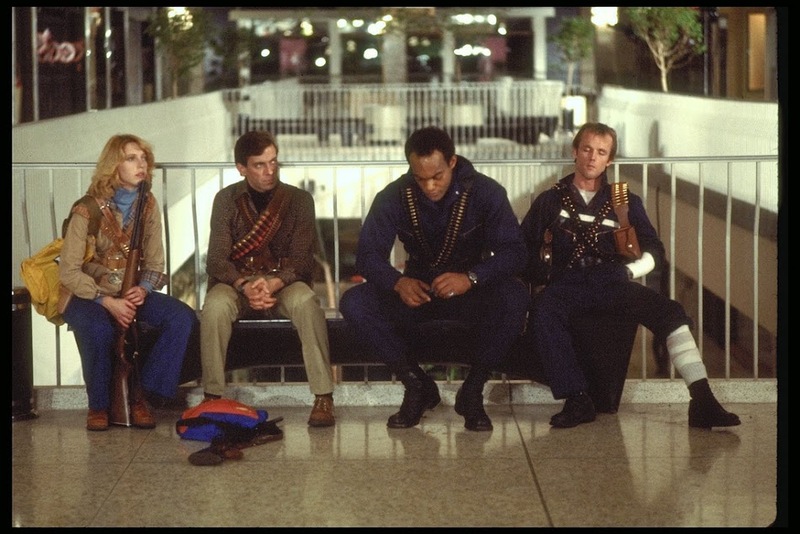 The shooter was Carter Johnson (Amari Cheathom), who's now a fugitive but Derrell secretly told Roman his whereabouts in exchange for the possibility of a reduced sentence. When Derrell turns up with throat slashed in the jailhouse shower the next day and Pierce informs him his termination is imminent since he angrily hung up on the prosecuting attorney and never conveyed her offer to Derrell, Roman decides he's had enough after nearly 40 years of "doing the impossible for the ungrateful." When an Armenian community center offers $100,000 for information leading to the arrest of the shooter, Roman anonymously provides the info and collects the reward money. He treats himself to a weekend vacation, buys some new suits, gets a new haircut and signs a lease at a posh apartment building. He plays ball and takes on some easy money cases at Pierce's practice and starts making friends, quickly seeing that playing the legal game and putting his hardball activist dedication aside--including an epic class action lawsuit he's been working on for seven years that he insists will redefine the nature of legal defenses and the concept of plea bargaining--means he can finally live the good life he's denied himself for decades ("My failures are self-inflicted," he tells Pierce). It should go without saying that Roman's impulsive actions will eventually blow up in his face, especially when a jailed Carter retains the services of Pierce, who hands the case off to...who else? Washington is terrific as Roman, even if his actorly affectations indicate that the film can't seem to decide if Roman's spectrum-stretching issues are that he's Rain Man, an OCD case, a social anxiety sufferer, or if he has Asperger's (the film seems to conflate them all under one all-purpose special needs umbrella). He manages to alienate everyone he meets, with the exception of Maya (Carmen Ejogo), an earnest volunteer activist for a civil rights group who comes to appreciate Roman's dedication to the cause, and more or less serves as his conscience once he starts wearing expensive suits and dining at classy restaurants. Washington's performance is effective, but at the same time, it's pure Oscar bait, and Gilroy's story just doesn't have any real foundation at its base, especially once it veers into commercial thriller territory in the third act. Roman's character arc is obvious and simplistic, and Washington is required to go through several scenes where he looks in a mirror and regards his flashy new appearance and silently ponders What I've Become. If Maya is Roman's conscience, then Pierce is the Roman that might've been--a beloved protege to Roman's partner who had the interpersonal chops to be a successful lawyer both philosophically and financially. Pierce is a good lawyer as well as a good businessman. Ultimately, he's hardly the unscrupulous shark we expect him to be based on his high-priced suits and slicked-back hair, even though his demeanor changes from scene to scene, especially in his attitude toward Roman. After ROMAN J. ISRAEL, ESQ--filmed under the generic title INNER CITY--screened to a middling response at the Toronto Film Festival, Gilroy recut some scenes and excised approximately 15 minutes to get it to its present, 122-minute length (Gilroy said much of the changes dealt with Farrell's character, which may explain why Pierce's attitude is so hard to pin down). Even now, its structure still seems off, especially after an opening that sets up the story as a flashback beginning three weeks earlier, which seems like an awfully short amount of time for this entire story to go down. NIGHTCRAWLER was a film that probably would've been a lot more scathing and hard-hitting if it didn't take place in such a cynical era, but it has a mesmerizing performance to make you look past it. 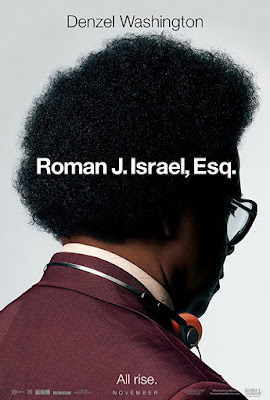 ROMAN J. ISRAEL, ESQ doesn't even have the limited substance of NIGHTCRAWLER and even pilfers some of its ideas and observations, coming up just a bit short even though it gets a lot out of an expectedly outstanding performance from Washington.